We provide highly concentrated pure technical of Endo Mycorrhiza. Product can be used for formulation of different Biofertilizers (powder/granules) in combination with various other ingredients. We assure uniform quality on each dispatch. 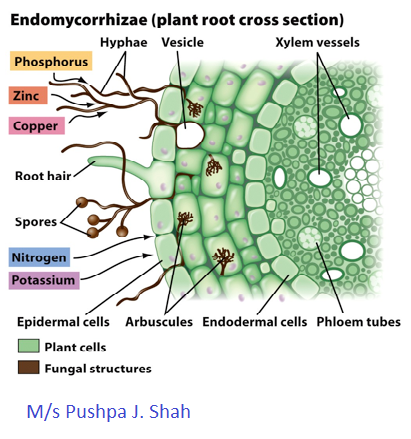 Endo Mycorrhiza, fungus root, describes the mutually beneficial, symbiotic relationship between fungi and plant roots. They have an exchange mechanism on the inside of the root (and the hyphae extend outside the root). Mode of Action: Symbiosis begins when fungal spores germinate and emerging thread like structures, called hyphae,enter the epidermis of plant roots. After colonization of the root, the fungus sends out a vast network of hyphae throughout the soil to form a greatly enhanced absorptive surface area. This results in improved nutrient acquisition and uptake by plant roots, particularly elemental phosphorus (P), zinc (Zn),manganese (Mn) and copper (Cu) and water. In return, the plant provides carbohydrates for the fungi.